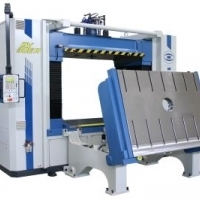 Millutensil Spotting Presses & Die Splitting Machines – Blue line is the first traditional line of products for Millutensil. As a matter of fact, the Millutensil trademark is synonymous around the world with try-out presses, i.e highly precise machinery created to make adjusting, checking and repairing of moulds easier which are always more complex. Hundreds of items have been supplied to important companies in every continent, especially within the automotive sector, where Millutensil has developed a considerable expertise which is the stimulus for continous technical improvement. Recently, a new product was added to blue line range: the die-splitter. It was developed following our customers’ need to easily handle big moulds, in the sheet metal sector. The die-splitter is an innovative, versatile and efficient solution, in line with the increasing automation of manufacturing processes and with higher safety standards. Now, blue line is for many tool-makers an important and indispensable technology, a synonym for quality.